I know we are BARELY into the holiday season, but this is the time to start thinking about making our holiday cards. So my thoughts turned to Christmas cards and I decided to share this one with you today. Ahh- the joy of scraps! I adore making cards with scraps laying out on my desk. This card is made entirely from little pieces of paper from here and there. 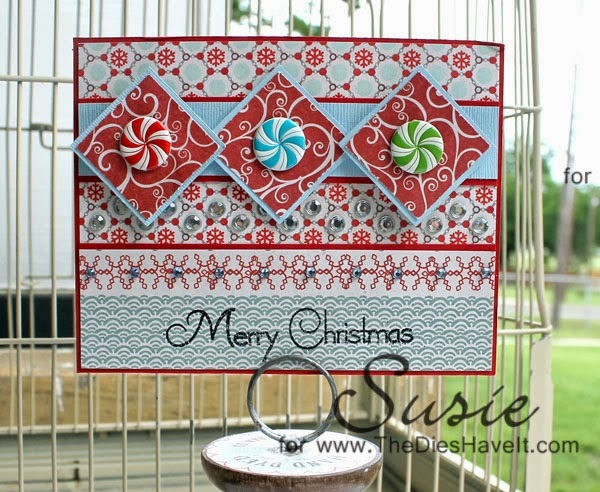 But of course the star of the show is the trio of Peppermint Candy Brads lined up on matted squares. As their name suggests...they look good enough to eat! I also added some Eyelet Outlet Jewel Bling to finish off my card. I hope I've inspired you to at least think about getting your Christmas cards ready. So, ready - set - GO!